Our lounge room, this morning, before cleaning. Put on a load of washing - floor rugs. Put on second load of washing - dogs beds - in outdoor washing machine. Clean the ensuite shower and sink. Wipe mirror with vinegar and newspaper. Scrub toilet, clean seat and lid, wipe over with tea tree. Finish off with sweeping the floor and mopping over with hot vinegar water. Second bathroom just needs a wipe over with a soapy cloth and dry with a terry cloth. Laundry room needs the sink scrubbed with the creamy soft scrubber. Wipe down the benches with soapy cloth, and dry. In the kitchen I'll wipe down the benches and clean the stove with a soapy cloth, and dry. Wipe the cupboard doors with my soapy cloth, clean glass in top cupboards with vinegar and newspapers. Scrub the sink with creamy soft scrubber. Check pantry and stockpile cupboards. Help H put up wall clock and framed prints after painting. Wipe over dresser and tidy kitchen table. 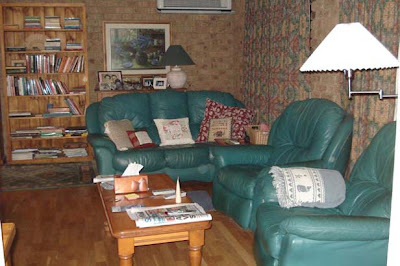 Tidy lounge room, wipe over coffee table. Finish off with vacuuming then washing floors with hot vinegar water. Regarding the stitchery giveaway. I've posted to Shula and have received Leah's address this morning. Thanks Leah. I just need Marianna's address now. Marianna can you please email your postal address to me. Thanks. your 'before' photo is a million times tidier than mine would be! I love to have a cleaning list. It really helps as I go through each room. It also made it easier for my daughter to understand what it really takes to "do up a room." I posted a while back about using natural cleaners in our home. My son has asthma and the scents and chemicals in store-bought cleaners are really harmful to him. We only use vinegar, baking soda, borax, Dr. Bronners, and rubbing alcohol to clean our home. I think I might post some pictures of our home on my blog. I really like seeing how others have things arranged. I feel like I know the person a little bit better. Clairesgarden, our loungeroon used to be much messier when the kids lived here. Kim, I used to think my home was too boring to photograph, but like you, I realised I like looking at photos of "real" homes, so I think others might find them interesting too. I'm going to be adding more in the future. Is Dr Bronners a soap? I love seeing pictures of real homes too :) Your cleaning list is great :) I am trying the 15 minute cleaning shannon Lush style for a few weeks...although still not allowed to mop, sweep or vacuum due to my back :( Mind you I pay my daughter to vacuum on the weekend and although it is not as good as I would do it, it is okay still :) Trying to let og of my perfectionism. Thanks for sharing your day. Looks like you where a busy little bee. I love seeing a real home. Yours looks so cozy. How did the cleaning go? Did you make it too the end of the list? I love to look at others homes, maybe I'm a sticky-beak? I did no cleaning today, but I did finish Harry Potter finally, now I can catch up on my lost sleep from the past few nights. Yes, Dr. Bronner's is a natural liquid soap. It is readily available in the States or can be ordered on-line. I like the peppermint scented variety. Lenny, I got all the work done by about 11.30. I was so tired at the end of the day, I went to sleep in my lounge chair. I never do that! But I guess getting up at 3am did me in. Lisa, welcome! I'm pleased to know you're trying this laundry powder. You'll love it, I'm sure. Try the hardware store for washing soda. If you're in Tassie, I think they call it Lectric Soda there. If you have no luck, ask Woolworths or IGA to order it in as they have it in their other stores so it will be in their warehouses. Stay in touch Lisa, and let me know how you go with the powder. Lisa, I wouldn't grate soap in your food processor. It will be too much for the motor. If you're going to make the laundry liquid, you can get around the grating by putting the soap in water for about 24 hours. It will go slimy and soft and you can then add it to your ingredients. You will have to reduce the amount of water you use in the final mix though. If you want to make the laundry powder, you might have to keep buying Lux flakes. Good luck with it. I've had an Asko for the past 15 years, we've replaced it now but it still works and we use it to wash the dogs beds and mats. It's plumbed up to the water tank on our back verandah. I too do most of my cleaning with vinegar. I dont think i'll ever shop down the cleaning supply isle of the store ever again. Obvioulsy they work well becauser your before picture is like a dream to a mom with 3 kids and a husband. Hi, I finished reading your book last week and discovered your blog at the end. What a great read! I am now looking forward to and dreaming about spending time at home(need to tame the mortgage first). As you've been away I have been catching up on some of your old news. Thank you so much for all the details. I have made laundry liquid and love it. Tried to make bread but I haven't been home to keep it warm, took 24 hrs although I am eating it my family wont. Maybe I'll wait til I'm on holiday. I've been doing some cooking from scratch and freezing some for during the week when I work long hours and often take shortcuts for dinner.This will be even easier and shorter and much better for us. Looking forward to cooking dog biscuits next!